Evan Parke, Jamie Bell, Lobo Chan, John Sumner, Craig Hall, Kyle Chandler. Fran Walsh; Director: Peter Jackson. - Highly Recommended. One of the greatest adventure stories in Hollywood history gets a new interpretation in this action drama from Academy Award-winning director Peter Jackson. In the early 1930's, Carl Denham (Jack Black) is a daring filmmaker and adventurer who has gained a reputation for his pictures documenting wildlife in remote and dangerous jungle lands; despite the objections of his backers, Denham plans to film his next project aboard an ocean vessel en route to Skull Island, an uncharted island he discovered on a rare map. Correctly assuming his cast and crew would be wary of such a journey, Denham has told them they're traveling to Singapore, but before they set sail, his leading lady drops out of the project. Needing a beautiful actress willing to take a risk, Denham finds Ann Darrow (Naomi Watts), a beautiful but down-on-her-luck vaudeville performer and offers her the role; cautious but eager to work, Darrow takes the role, and one board the ship she strikes up a romance with Jack Driscoll (Adrian Brody), a respected playwright hired by Denham to write the script for his latest epic. When Denham and Company arrive on Skull Island, the natives react with savage violence, but they happen to be the least of their worries. Skull Island is a sanctuary for prehistoric life, and lording it over the dinosaurs and other giant beasts is Kong, a twenty-five-foot-tall gorilla who can outfight any creature on Earth. The natives kidnap Darrow, giving her to Kong as an offering to appease the giant beast; Denham and his men set out to find her, with Driscoll bravely determined to save the woman he loves. Eventually, Driscoll finds Darrow and Denham outwits Kong, intending to take the giant ape back to New York for display. But Kong has bonded with Darrow, and his attraction to her proves to be his undoing. Andy Sirkis, who provided the body movements for Gollum in Peter Jackson's Lord of the Rings pictures, performed similar duties on King Kong, studying gorillas so he could mimic their actions, which were then used as the basis for the special effects crew's digital animation of the great ape. It is available as a single disc or a two-disc package. The price of the "extras lacking" single is under $10us. The two-disc set contains 3 hr. 20 mins. of extras. The feature is presented 2.35 widescreen anamorphic and 5.1 dolby digital sound. The extras are presented 1.8 widescreen and 2.0 digital stereo. The feature disc also contains a 2 minute, behind-the-scenes look of a VW Toureg commercial and a one minute "Wish You were here" New York City Commerical. The second (Extras) disc contains 152 minutes of "Post Production Diaries", a conclusion of the production diaries that were shown at the "Kong is King" website, during the film production. Also included on the second disc is a 28 minute featurette of 1933 New York and a 17 minute mockumentary, 'Skull Island: A Natural History'. R1 2-disc prices are about $10us. R2 pricing is about 6# or 16eu. R4 2-disc pricing is about $12au or $15nz. R1 subtitles include: English, Spanish and French. UK R2 subtitles include: English, Arabic, Icelandic. 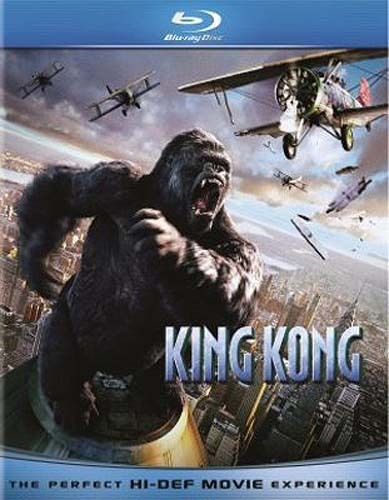 On 14 November 2006, Universal released the Extended Edition DVD version of King Kong. It is a three-disc set which includes 13 additional minutes more than the theatrical version. It is 2:35 anamorphic widescreen with 5.1 surround. The R1 version has English, Spanish and French language tracks with English, Spanish and French subtitles. The R2 and R4 versions have English, French and German language tracks with English, French, German, Danish, Finnish, Norwegian and Swedish subtitles. All versions have an optional feature commentary track with Peter Jackson and Philippa Boyens. Expect the U.S. price to be about $20us. In New Zealand it sells for about $40nz. The R2 versions are about 7# or 9eur. There is also a gift-set version that contains a King Kong figurine, selling for about $50us. Disc One: Feature Part 1 - 87 min. Deleted Scenes Introduction by Peter Jackson - 3 min. 16 Deleted Scenes - 37 minutes, with optional introductions - 9 min. 'The Eight Blunder of the World' Featurette - 19 min. 'A Night in Vaudeville' Featurette - 12 min. 'The Mission Production Diary' - 8 min. Disc Two: Feature Part II - 115 min. 'The Present' - An original short film made by cast members - 10 min. 'Weta Collectables' Featurette = 5 min. * Arrival at Skull Island - 4 min. * Bronto Stampede - 6 min. * T-Rex Fight - 10 min. * Empire State Building Battle - 10 min. Trailers: Teaser, Theatrical and Cinemedia. Peter Jackson Introduction - 3 min. Recreating the Eighth Wonder: The Making of King Kong - 186 min. * The Origins of King Kong - 16 min. * Pre-Production Part 1: The Return of Kong - 42 min. * Pre-Production Part 2: Countdown to Filming - 16 min. * The Venture Journey - 22 min. * Return to Skull Island - 30 min. * New York, New Zealand - 26 min. * Bringing Kong to Life Part 1: Design and Research - 48 min. * Bringing Kong to Life Part 2: Performance and Animation - 26 min. Conceptual Design Galleries - 41 Min. * The 1996 King Kong - 10 min. * The Venture - 4min. * Skull Island - 16 min. * New York Video - 4 min. * Kong - 7 min. DVD Credits - 5 min. As of December 2009, the all-region Blu-Ray version is $15-20us, $40nz, $40au, 12# and 17eur. It contains both the 187 minute theatrical cut and the 200 minute extended cut. They contain English SDH, French and Spanish subtitles. The German version has additional subtitles in German. Audio options are: English DTS-HD Master Audio 5.1, French DTS 5.1, Spanish DTS 5.1, English Dolby Digital 2.0. The German version has additional DTS 5.1 audio options in German, Italian and Japanese. It has an audio commentary by Peter Jackson and Philippa Boyens on the extended cut only. It also contains a "U-Control" interactive experience: Picture-in-Picture video commentary and "My Scenes" bookmarks and sharing. Of course it is presented 2.40:1, 1080p 24fps. None of the extras that were included with the extended 3-disc dvd are included on the Blu-ray version. As of 07 February 2017, a 2-BD50 region free set was released with one BD containing the extended edition (200 min.) of the feature (1080p) with the commentary track included on the previous extended edition BD, and about 10 hours of extras at 480i, on the other BD disc, plus a DVD of the feature only. The Extras contain production diaries previously on DVD, but organized into sub-sections with some repeats. The extras also contain the 3 hour 'Making of King Kong', post-production diaries and many other items. See the Martin Liebman Ultimate Edition Review linked below for further details. This set sells for about $15us, 15eur, 8# or $30au. Starting 11 July 2017, a three disc set will be released in the US and Canada that contains much the same contents as the February set on two 1080p BD50's, plus a third BD100 of the feature written for 2160p 4k. The 4k audio options are: English DTS:X Master, Brazian Portuguese DTS Digital Surround 5.1, English DTS Headphone:X, French Canadian DTS Digital Surround 5.1, Japanese DTS Digital Surround 5.1, Latin Spanish DTS Digital Surround 5.1. It will be selling for $30-40us. There is no DVD version in this set. The Bonus features have the following audio options: English DTS-HD Master 5.1, French DTS Digital Surround 5.1, Spanish DTS Digital Surround 5.1. The 4k feature has optional subtitles in English, Spanish, French, Japanese and Brazilian Portugese. The extras has optional subtitles in English, Spanish and French. There are feature commentary tracks with Peter Jackson and Philippa Boyens. This same three disc 4k set will also be release 12 July in Australia and New Zealand. This three disc 4k set will also be released 17 July in Sweden, Denmark, Norway and Finland with the only difference being the addition of subtitles for those languages. Starting 25 July 2017, it will have a French version of this 4K release, with French subtitles. A German 4K is scheduled for a 03 August release. Google Play Rental or Purchase - Standard Edition. Google Play Rental or Purchase - Extended Edition.